McLean, Va. – BOWA (www.bowa.com), an award-winning residential design build firm specializing in luxury additions and renovations received high honors from the Maryland Building Industry Association (MBIA), the Northern Virginia Building Industry Association (NVBIA) and the Washington Metropolitan Sales and Marketing Council (WMSMC) as the winner of two 2016 Great American Living Awards. The awards were accepted by BOWA’s Josh Baker, Founder and Co-Chairman, Tim Burch, Vice President, and Valery Tessier, Project Architect on October 6, 2016. 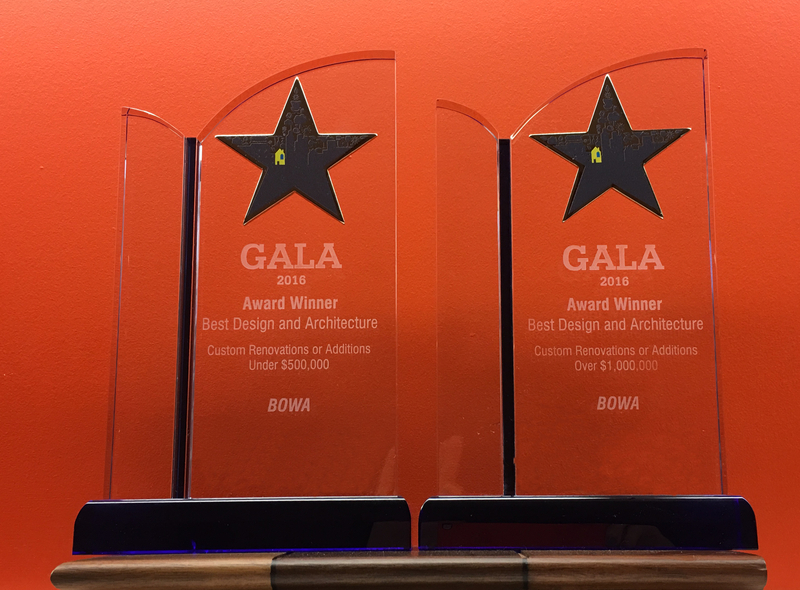 BOWA won GALA’s Best Design and Architecture for renovations in two “Entire House” categories, one for “Under $500,000” and one for “Over $1,000,000.” The award for “Entire House Under $500,000” went to a whole-house renovation project in Bethesda, MD. Every area of this classic colonial was touched with a focus on improving the first floor flow, remodeling the kitchen and family room and creating a beautiful spa-like master bath. In the “Over $1,000,000” category, a Waterford, Virginia renovation project won the top spot. This design build project transformed a dated farmhouse into a spacious home with a rustically contemporary look. An easily accessible outdoor pavilion and deck were designed to create additional space for the homeowners, who frequently entertain. “The BOWA team is honored to be recognized at the Great American Living Awards again this year,” said Tim Burch, Vice President of BOWA’s Middleburg office. “The Waterford project was an exciting project for great clients. We touched every square inch of that home and transformed it into something that is comfortable for both quiet time at home and large-scale entertaining, and pays homage to its beautiful Virginia Piedmont setting. In addition, BOWA was honored the night before at the 2016 Remodeling Show | DeckExpo | JLC LIVE in Baltimore. Josh Baker accepted the Qualified Remodeler Magazine Top Performers Award for Detached Structures. Currently, BOWA ranks 35th in the magazines Top 500 list of firms across the country. These awards are the latest recognition for BOWA, which has received more than 200 local and national awards honoring the company’s business excellence and design and construction expertise on projects ranging from master suites and kitchens to whole-house and whole-condo remodels. For additional information and photos of BOWA’s award-winning projects, please visit www.bowa.com. With a focus on delivering remarkable client experiences, BOWA specializes in luxury renovations ranging from master suites and kitchens to whole-house and whole-condo remodels. For over 28 years, BOWA’s design build experts have been guiding clients through every step of the remodeling experience from the first thoughts of the project, throughout architecture and construction, and continuing through a lifetime of ownership. And, consistently, 95% of clients rate BOWA a 9 or a 10 when asked if they would recommend the company. BOWA’s commitment to customer service and industry-leading budget guarantee, schedule guarantee and warranty are among their reasons. With offices in McLean and Middleburg, Virginia, BOWA has won more than 200 awards for business, design and construction excellence and serves clients in Suburban Maryland, the District of Columbia, Northern Virginia and Virginia’s Hunt Country. For more information, visit www.bowa.com or call 703-734-9050.